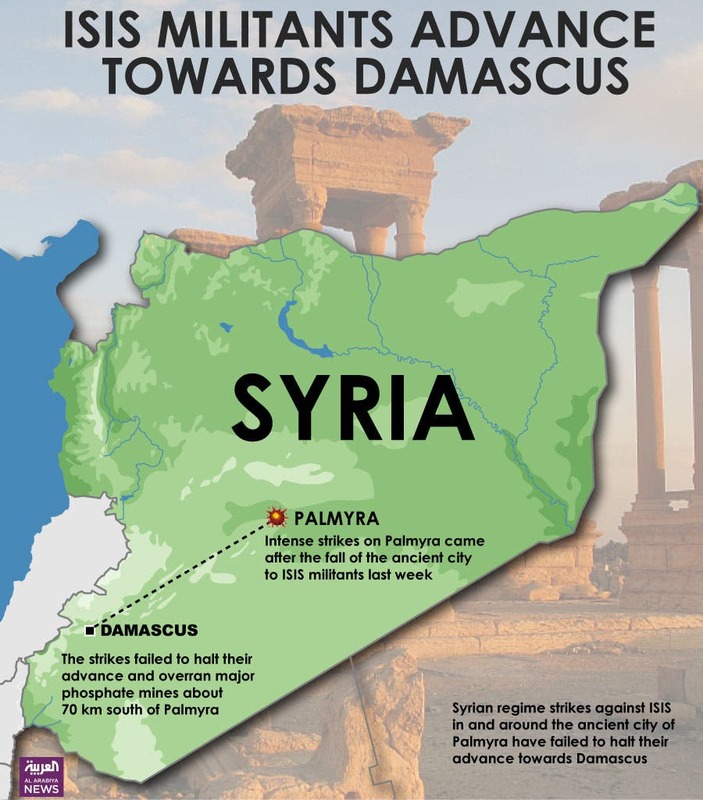 Syrian regime strikes against ISIS in and around the ancient city of Palmyra have failed to halt their advance towards Damascus, a monitor said on Sunday. The intense strikes came after the fall of Palmyra, named Tadmor in Arabic, to the militants last week. But so far, the strikes had failed to halt the militants, who advanced towards the capital Damascus and overran major phosphate mines about 70 kilometers south of Palmyra. “ISIS has made further progress on the Tadmor-Damascus highway and grabbed the Khnaifess phosphate mines and nearby houses,” said the Syrian Observatory for Human Rights, which relies on a network of sources on the group for its reports. “It has extended its control over larger areas and even greater economic interests,” added the monitor. A Syrian military source on Sunday told Agence France-Presse that the air force struck more than 160 ISIS targets. “We are pursuing Daesh wherever they are,” the source said, using the Arabic acronym for ISIS. “The air force struck more than 160 Daesh targets, killing and wounding terrorists and destroying weapons and vehicles equipped with machine guns” on Palmyra’s outskirts and elsewhere in the east of Homs province, the source said. “Military operations, including air raids, are ongoing in the area around Al-Suknah, Palmyra, the Arak and Al-Hail gas fields and all the roads leading to Palmyra,” he said. State television said “more than 50 Daesh terrorists” had been killed in the air strikes. The Syrian Observatory for Human Rights said at least four civilians had been killed in the raids, which were the most intense since the militants overran the city on Thursday. 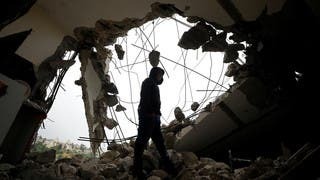 The strikes targeted several areas of the city, including some close to the city’s famed Graeco-Roman ruins, a UNESCO world heritage site, Observatory director Rami Abdul Rahman told AFP. Dozens of people had also been wounded in the raids, and ISIS was believed to have taken losses when a military security building was hit, Rahman said. ISIS is accused of executing hundreds of people in and around Palmyra since it swept into the oasis city last week after a lightning advance across the desert from its stronghold in the Euphrates Valley to the east.